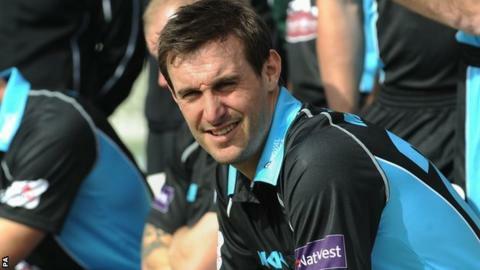 Worcestershire skipper Daryl Mitchell made his second-highest score in County Championship cricket as his side's game at Hampshire petered to a draw. After a rain-hit first day followed by a totally washed-out day two, the visitors began the final day on 103-1, replying to Hampshire's 263 all out. Mitchell, 44 overnight, made 172 not out, backed by 69 from England's Moeen Ali in a total of 350-7 declared. Daryl Mitchell hit the 15th first-class century of his career - his first since the Essex game at New Road last May. The 30-year-old captain's highest score in first-class cricket remains his 298 against Somerset at Taunton in 2008. Hampshire then saw the game out, reaching 27-1, Moeen taking a wicket. Worcestershire's final-day efforts at least ensured a healthy haul of four batting bonus points from their weather-ruined opening game, in contrast to last season's meagre haul of just 29 in 16 matches - the second lowest in the country. Mitchell's decision to declare with only seven wickets down denied Hampshire maximum bowling points. The 17 overs sent down in the final session by spinners Moeen and Matt Pardoe also allowed Worcestershire to improve their over-rate. Moeen also did his international prospects no harm by claiming the wicket of England's winter Ashes opener Michael Carberry. Worcestershire's next Division Two fixture is at home to Kent next week, starting on Sunday (13 April), for which they hope Pakistan Test spinner Saeed Ajmal will be ready. Hampshire, bolstered by South African seam bowler Kyle Abbott, are on the road, travelling to Bristol to face Gloucestershire. "This match ended in a inevitable draw, with Matt Coles and Liam Dawson the pick of the bowlers on a mixed day in the field for the home side, but we still learnt a great deal. "We learnt that Worcestershire skipper Daryl Mitchell is in superb form and, on this showing, will easily surpass his 824 Championship runs from last season. "On the flip side, Michael Carberry again failed, making five innings (including pre-season games) in which he is yet to reach double figures. "Both sides will be boosted in the bowling department for their next fixtures, with Kyle Abbott due to arrive on Wednesday for Hampshire and Saeed Ajmal now available to Worcestershire."